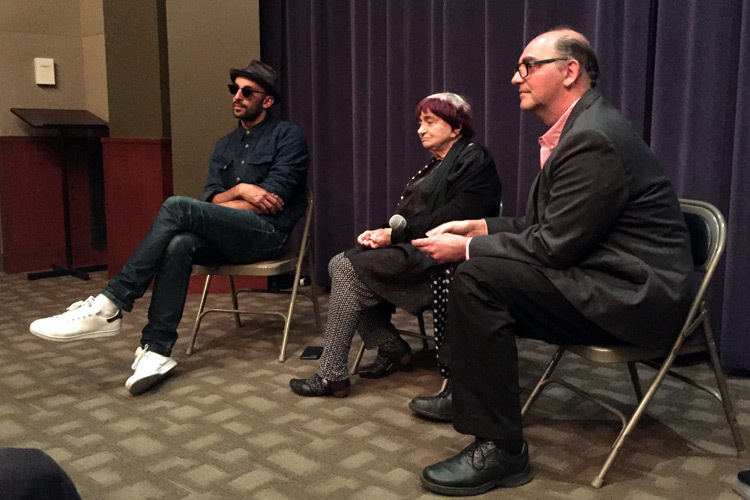 The following questions and answers are excerpted from a conversation that followed the NBR screening of Faces Places. JR: Yes, definitely and that’s why we got along well. From the beginning, there was never this weight of making a big film, so we just wanted to do something short together. So by this small idea, we just picked a place and went there. We did this for seven or eight months where we didn’t even talk about a film. Of course Agnès’ daughter, Rosalie, who introduced us may have seen this film coming together. But we were naive and just wanted to make a little piece. Agnès Varda: If I take one example we love very much, JR would bicycle on the beach. He noticed a part that fell from the cliff, so he wanted me to come and one day I finally did. When I got there, I realized that I knew the place and had visited in 1954. The world is big and France is big, but this is one place we both met and loved separated by fifty years. I would say luck was more than an assistant. We see the whole process, including the decisions being made as you go through a few potential pictures and visit a potential site. It was wonderful watching you both collaborate and ultimately come up with the perfect choice. Can you talk about that journey? Varda: Perfection is not in our vocabulary. We are always trying to reach something and that desire is enough for us. The desire to travel is better than traveling at all. In a magical trip, we decided where to go and once we got there. Things and people came to us. Sometimes we knocked on doors and nothing. We’d go to another street and meet someone like Jeanine who was wonderful because she was so moved by the images. People were part of everything we do and their reactions played a big role in that. JR: We spent weeks in Agnès’ kitchen just talking, so that’s why the decision of choosing where to go was a journey in itself. How long does the art stay up by its own accord? JR: We never know how long they stay. Sometimes it’s years and other times it’s not even a night. In this film, the weather decided, such as the wind or place. There are things like a farmer isn’t there anymore because the winter passes and the weather has washed it away. It’s funny though because sometimes you see a tiny silhouette and in people’s minds the art is still there. In our film, we were in villages with people, so we never needed authorization and just pasted on their houses. Varda: We ask the people to paste on their walls and sometimes they say no. So we made it in a peaceful way, which is surprising. We come with the magical truck and it was made with an agreement with people. We are artists bringing friendship and peace. We never asked people their politics and wanted to keep it person to person. Your collaboration started a few years ago. What was the process of making the film around that friendship? Varda: We decided to shoot one week every month. Not only because we had to look for other places, but I’m also not that strong and shooting is difficult. You run and go in and out and speak with new people. They were bringing little chairs for me here and there and even with a nap in the middle of the day, it’s still exhausting. How did your post-production process work and how the story come together? Varda: We started to see what we had after two or three months of shooting. The project is one thing, but what we have shot is a film. JR and I looked at things missing and would go add it. After fifteen or so months of shooting we brought in an editor and we edited the film for six months. JR: The editing and long patience is all Agnès and that’s why she’s signing the edit and that’s why a lot of her genius is present. Day and night she would think about the movie and FaceTime me at two in the morning then I would come to the edit and give my notes and she’d not listen to any of them. But actually, it’s an intense moment because it’s tiring to connect all of the ideas. She also had to teach me how to do the voiceover that’s intuitive to her, which I found difficult. Varda: What we did was try to add two voices to make fluidity of the edit whether it was a song or a joke so we guided people through the places.